Born in Zimbabwe (then Rhodesia), Mary was the daughter of Marjorie, Samuel's first child. 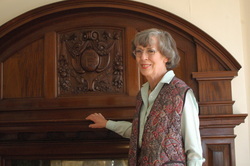 Mary briefly attended Loreto College and Lyndale School St Albans before going to art school. She met there and married Hector Moore, blacksmith, farrier and metalworker of Brandeston, Suffolk. 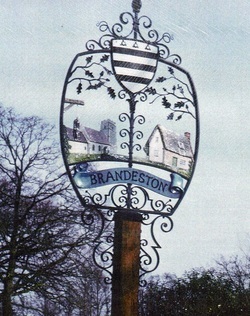 Soon they put their combined skills together and created many ornamental village signs which are a unique feature of the East Anglian and neighbouring counties' landscpe. After 50 of these, Mary is now retired and living happily in the same village where she and Hector enjoyed 44 years of creative work together. This village sign was designed by Mary and forged by Hector, her husband, to mark the Queen's Silver Jubilee in 1977. The shield shows the arms of the Revett family, builders of Brandeston Hall and benefactors of the church, All Saints Church. The Revd. John Lowes, vicar for 50 years was accused and hanged for alleged witchcraft in 1646. Margaret Catchpole's cottage: Margaret Catchpole, notorious in Suffolk, was deported to Australia for horse stealing, never returned, but wrote many letters about her life there between 1802 and 1811, which have become historic documents.